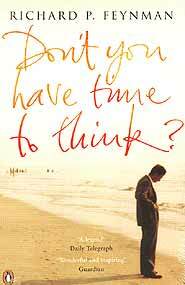 Book Review: Don’t you have time to think? Richard Feynman, was a brilliant man who was a Professor of Theoretical Physics in America. He was awarded a Nobel Prize for his work on quantum electrodynamics. The true nature of the man can be seen from his response to questions asked as to what it felt like, to receive such a world honor. “I don’t see that it makes any point that someone in the Swedish Academy decides that this work is noble enough to receive a prize – I’ve already got the prize. The prize is finding the thing out, the kick in the discovery, the observation that other people use it (my work) – those are the real things, the honors are unreal to me.” Apparently, according to the letters in this new book “Don’t you have the time to think?” (ISBN 0-141-02113-6, Penguin books, 2005, edited by Michelle Feynman), the great scientist was going to turn down the prize, but the news of the award was given to the press before he could stop the process. Though, of course, this might have been grandstanding, something he was often accused of. This new book is a collection of letters, collated into around five year interval sections, running from 1929 through to 1987, the year before his death from cancer. Yet he could be patient and charitable, assisting many young students to continue their studies of Physics, even to the point of contacting a professor he knew in Poland to have a Polish student’s visa extended. For those people who have been admirers of Feynman, and I am one of those, this book is an interesting exercise in trying to fathom the character of this very complex man. Yet he was a man who could describe complex physics in terms that made it understandable for the layman. So much so, that his television lectures were immensely popular all over the world. At B. 495 in Bookazine, it is an outstanding book of communiqu้s written by an outstanding human being. And it is those last two words that make this book so memorable. Richard Feynman may have been one of the great thinkers of the 20th century, but he was also a human being, with all the fears and frailties and abilities that human beings possess. He just made less of some traits and more of others. That was Feynman’s legacy. Your job is to try and make your own judgment reading his letters and decipher his lust for life. After the release of their fourth album ‘Lunch’ (1972), a very lacklustre affair, Britain’s premier Art-Rock band ‘Audience’ imploded. Things had started so promisingly with their original self titled debut album in 1969 released by Polydor Records. But although it met with great critical acclaim the record buying public turned a deaf ear and hardly a copy left the record shop. The band was immediately dropped like a hot potato by Polydor, to be immediately picked up by the new progressive rock label Charisma Records run by Tony Stratton Smith, who had been impressed with the band when he saw them supporting Led Zeppelin at the Lyceum in London, England. Howard Werth had a unique soulful voice, and his choice of instrument, an electric nylon strung guitar, gave the band a distinctive sound. Keith Gemmell was perhaps the number one saxophone and flute player of his day. It can be fairly laid at Keith Gemmell’s door that he really made the saxophone a hard rock instrument, whilst his flute playing lent light and colour to the sound. In Trevor Williams on bass and Tony Connor on drums they had a rock solid rhythm section to build upon. Tony Connor’s style also gave the band a bit of a jazzy feel, so there were not many elements of music that were left out of the ‘Audience’s’ repertoire. But even with the release of a separately recorded single ‘Indian Summer’ (1971), which started to rapidly climb up the American charts, the band and record label felt despondent about their lack of immediate commercial success, which in hindsight is hardly surprising considering the competition they were up against, Led Zeppelin, Free, Genesis, Pink Floyd, etc. They should have perhaps bided their time instead of pushing out the poor ‘Lunch’ and splitting up. Rock ‘n’ roll is a funny old world and after often bumping into each other over the years, they decided after thirty three years to give it another go. Keith Gemmell, Howard Werth, and Trevor Williams were all keen, but it was too much to ask Tony Connor to give up the security of his position behind the kit with Hot Chocolate who have a very heavy gigging schedule. So the hunt was on for a new skinsman, the band had to search long and hard to find somebody as versatile as their former drummer. But when they came across John Fisher they had their man. He had plenty of rock experience, including a stint with the Blue Bishops, but had also served in big bands, leaving himself open to any form of music. John’s open mindedness was essential, so was his sense of humour, playing with this bunch of jokers. Once rehearsals were complete for the first time in thirty three years ‘Audience’ hit the road. After their first tour the last concert at Deal in Kent’s Astor Theatre was recorded for release. Some may say that a live album from Audience may be thirty three years too late, as if a live album had been released in 1973, it may have broken them into the big time then. But better late than never I say. There’s something about this album that defies believe. If these guys have been apart for so long, how come they have almost telepathic sense in their play whilst at the same time being so relaxed, and obviously enjoying themselves? You can actually hear them grinning at one another through the music as they play along. One could be forgiven for thinking they had done nothing else in the intervening years. There are ten songs on display. Three from ‘The House On The Hill’, opener ‘Your Not Smilin’ - a jaunty and well chosen song to play first up, the haunting ‘I Had A Dream’ and a ten minute version of the title song with plenty of improvisation from Keith Gemmell; one song from their debut ‘Leave It Unsaid’ and one from Friends, Friends, Friend; the moving ‘Nothin’ You Said’; which leaves room for two songs from Howard Werth’s last solo album, ‘The Evolution Myth Explodes’ - a Werth composition Zig-Zag and Swirl, plus a stunning interpretation of Lennon and McCartney’s ‘I Wanna Be Your Man’, which the boys originally wrote for ‘The Rolling Stones’ when they could not write themselves a hit back in 1963. Audience have taken the song, taken it apart, and slowly burnt it back together again. There is no point doing cover versions unless you have something to add to it or a different slant to add. ‘Call Me Responsible’ is a chance for Keith Gemmell to show of his skills and sense of humour. This is immediately followed by the old James Brown classic ‘The Bells’ which gives Howard Werth his chance to show that the talents of his throat have in no way diminished. Finally, as an encore, the band launches into the late great Tim Rose’s ‘Morning Dew’, which will send shivers up and down your spine, such is the emotion poured into the song by the band. As a live album it may have come a little late in the band’s career, but nothing diminishes pure raw talent. I for one hope that the band gets some more belated success, as news seeps through that we may be treated to an all new studio album later this year. You may think the name of this album a little strange but actually it just goes to send up the band’s sense of humour. 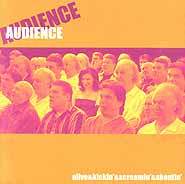 The album cover shows an audience sitting in complete boredom watching a band, until you look a little closer and realize that it is a collage of the band themselves in the audience watching themselves (the look of distaste on Keith Gemmell’s face is hilarious). Which just goes to show that Audience are indeed ‘Alive and Kickin’ and Screamin’ and Shoutin’.